Husband and wife team, Helen Taylor and Ian Campbell will guide you through what can be a very exciting and enjoyable, creative experience. Helen Taylor Garden Design provides professional garden and landscape design services for domestic and commerical clients as either a Full Service (from the initial meeting to through to completion) or a One Day Sketch Design. Through our sister company, Helen Taylor Plants and Planting, we provide the supply and planting of plants. The practice, based in Burley in Wharfedale near Ilkley, was established in 1999 by Helen Taylor (Registered Member of the Society of Garden Designers). She runs the business with her husband Ian Campbell (Chartered Member of the Landscape Institute). Project areas are mainly Ilkley, Skipton, Harrogate, North Leeds and York. We are very happy to consider garden commissions throughout the UK – we have designed gardens in London, Scotland and even Belgium. Both Helen and Ian have worked in the landscape industry for over 25 years and have a wealth of experience to offer. Working with architects as part of a design team on large and complex projects at the design and site stage. Excellent working relationships with reliable local landscape contractors. Knowledge of the local area for the planning system, tree legislation and the soils/ microclimate. Designing sloping gardens given the geography of the local area. Proven design skills – a large portfolio of gardens designed, built and planted. Perennial planting. Helen has designed and planted many mixed borders and is known for the soft character of her planting and clever use of colour. Planting for wildlife. Ian has experience of native planting to encourage wildlife and biodiversity. Before setting up Helen Taylor Garden Design in 1999, Helen worked as a landscape architect in both the public and private sectors in the north of England and Scotland for 12 years. Helen read Geography at Durham University before studying for a Masters degree in Landscape Architecture at Sheffield University where she met Ian. She is a fully qualified Landscape Architect and Registered Member of the Society of Garden Designers (MSGD). She has achieved design awards for her work over her career including a prestigious Society of Garden Designers award for a local community garden, the Garden of Creation at the Methodist Church in Burley in Wharfedale in 2010. Helen provides talks on garden design for local garden groups. She was a visiting lecturer at both RHS Harlow Carr, Harrogate and at Leeds Met. University in garden and planting design. Favourite local garden: York Gate, Adel for the clever layout and detailing. 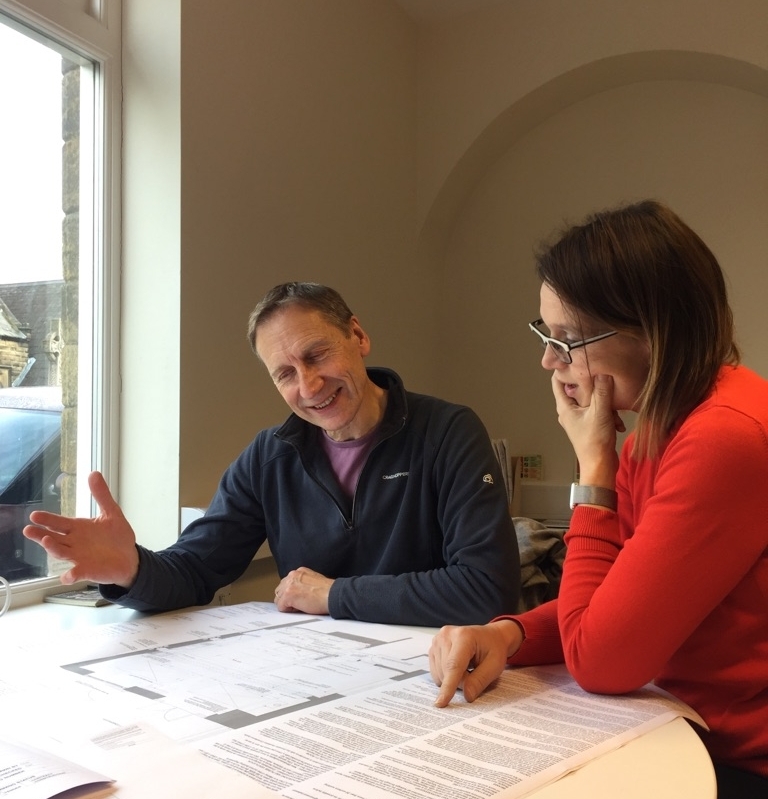 Ian also worked as a landscape architect in both the public and private sectors in Scotland and the north of England, working on a large variety of projects from parks, schools, leisure and historic conservation to city centre regeneration, residential and community led regeneration. Ian studied Environmental Science at Stirling University and worked in countryside management before heading to Sheffield to take up a place on the Master’s degree course in Landscape Architecture where he met Helen. He is a fully qualified Landscape Architect and a Chartered Member of the Landscape Institute (CMLI). Ian enjoys applying his skills to the wide variety of garden commissions and since joining Helen in 2015, he has completed many projects from small formal town gardens to large contemporary gardens. Favourite Garden: Parcevall Hall Garden, Appletreewick for its sense of place, views and contrast in spaces.